CAN LYFT LIFT THE MARKET? Thursday was another seesaw session that exposed the dilemma for would-be buyers: finding value with minimal risk. Of course, most investors consider less expensive share prices as an indication of value. While it’s true, beaten-down stocks often overshoot on the downside. There must be more to be considered cheap, and that’s the dilemma. Many professional investors have been going with the notion of buying the beaten-down markets, sectors, and names. Emerging markets and Financials (XLF) have been favored by the pros for the last few years and have underperformed. However, that doesn’t mean big money won’t continue to chase non-performance. I’m bringing this up because the action in Financials caught my eye yesterday. At one point, among the worst sectors, buyers emerged late in the day and XLF rallied to be one of the best performers. I need to see more, but the sector is highlighted on my radar. The Financials are going to be fun to watch today after Tim Sloane announced he is bowing out as head of Wells Fargo. Officially, he’s retiring, but the news was treated as a victory for Senator Elizabeth Warren, who had publicly demanded his dismissal. I think it’s good news for the company and its shareholders. I’m not knocking Sloane but considering the magnitude and the chutzpah of their crimes against their own customers, the bank needs an outsider to right the ship. Wall Street agrees as the share price popped after the announcement. I don’t want Warren and Ocasio-Cortez getting all the wins or pushing around banks, which is why they better step up and police themselves and take a principled stance. Not all transportation industries are the same. Delivery companies United Parcel Service (UPS) and FedEx (FDX) have their own issues, particularly the latter, while airlines haven’t been helped by the Boeing (BA) saga. Truckers have their moments, but they also have more regulatory hurdles than most industries. The rails have the best track (couldn’t resist) forward and did so yesterday. We have exposure to the rails and will probably raise our target on Norfolk Southern (NSC) today. 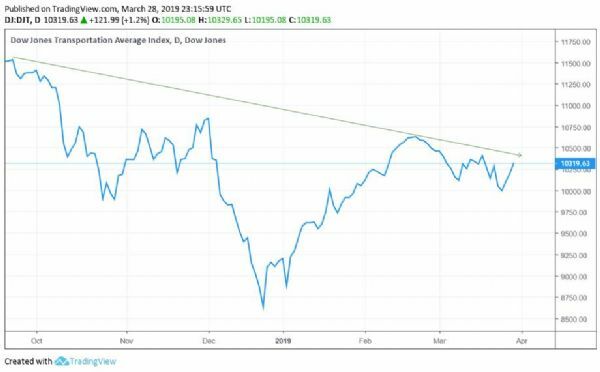 As for the group, keep an eye on the Dow Jones Transportation (DJT) Index, mired in a downtrend marked by a series of lower lows. It could be on the cusp of a trend reversal breakout soon. We took profits on two more positions in the model portfolio yesterday. Subscribers should have at least two positions of cash on hand. It’s all about the initial public offering (IPO) of Lyft today. The ride-sharing company starts trading, having settled on a final offering price of $72.00. There is a chance the stock could pop over $100.00, which wouldn’t be unusual. Many of these hot tech IPOs rallied more than 40% on the first day of trading. The conundrum is what numbers to use in your investment decision. You can use old-fashioned things such as revenue and earnings trends, and see the company is losing a ton of money, with no plans to bring cash to the bottom line anytime soon. Conversely, the company is bolstering its fleet of drivers and growing the number of rides exponentially. I’m grappling with this as far as buying on the open. If you could get $85.00 or less, I think it’s worth a shot; otherwise, beware of market orders that you discover are filled at the high of the session. I probably wouldn’t be a buyer until one or two earnings reports are released. The upside bias remains in place after so so data. According to the The U.S. Bureau of Economic Analysis (BEA), Personal income decreased $22.9 billion (-0.1 percent) in January, disposable personal income decreased $34.9 billion (-0.2 percent), and personal consumption expenditures increased $8.6 billion (0.1 percent). The market is pointing to a higher open and suggest we could have huge day.